Pillow newborn baby may need, but not to put it under her head. Manufacturers have taken care of a variety of baby safe pillows are attractive shapes and colors for correcting congenital defects and just a comfortable sleep of the baby. Experts in the field of Pediatrics in one voice declare that a newborn baby is absolutely no need of the hillock, artificially created for the head. However, the manufacturers of children's products so Excel in the manufacture of all sorts of canopies and bedding that not every parent will resist the temptation to buy a kit which includes and elegant small pillow case. And she certainly wants to find a use for! To determine and equip the place for a comfortable sleep of a newborn is very important, because in the first months of his life all he does is sleep, taking breaks for meals. Under the head of such crumbs is enough to put a flannel blanket, folded in four layers. The pillow can damage the formation of the spine, which is still too weak. And still the doctors are not against some pillows, if your child has any birth defects. So, it is recommended to pick up on the advice of a podiatrist special pillow in case of defects of the neck or some irregularities to the shape of the skull when baby always turns his head only to one side or sleeping only in the occipital part. Other features sleeping newborn belong to the physiological. Perhaps the child often rolls over on stomach or spits up profusely in my sleep. For these cases, there are children's pillows to prevent suffocation or oblong pillow-positioner, locking position on the side. They are used for putting under baby's head. Not so long ago, mom just folded for this purpose a roller Blankie. The usual square or rectangular pillow will need more than the previous year, and even better a year and a half. Although the feathers of birds are natural materials, filling their children's pillows excluded in order to avoid allergies. Taboo is imposed also on wool, cotton, buckwheat husk. It is best to use a pillow made of synthetics: holofayber, a synthetic winterizer, artificial Swan's down. 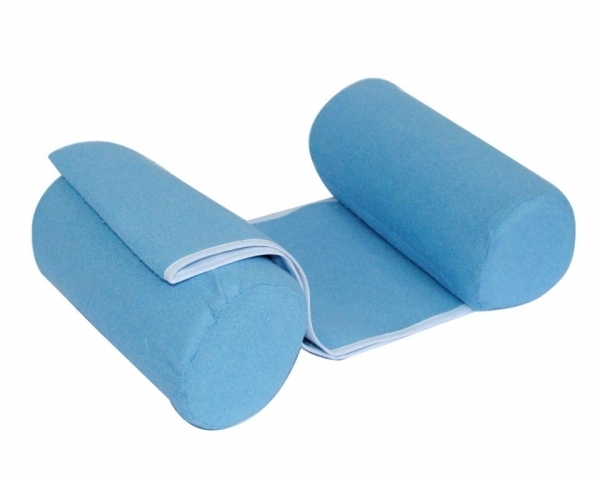 In orthopedic pillows, the filler is komforel (small balls), latex, polystyrene, polyurethane foam. For the price of the most expensive is latex, because it has the property to fix in the correct position the shoulders and neck. No matter how high quality or a filler, parents oenologie that he began to break out. The child immediately pulls the content into his mouth. Size pillow traditional shape must occupy the entire width of the crib to stop the baby slipped from her. Although some children so much spinning in my dream, that this doesn't work. Some manufacturers approach even more responsible to the manufacture of children's pillows and observe the slope of 15 degrees between the upper and lower edge, recommended by podiatrists. If selection of children's pillows fell all the same to sleep, it is better to use the products of famous brands, which are natural fillers heat and antiseptic processing. Synthetic pillow should not have an unpleasant smell, which indicates a technological violation.